understand views on our proposals. environmental bodies, third party infrastructure owners and landowners to understand local environmental features and engineering challenges. can be installed in a timely and realistic manner at reasonable cost. We presented several corridor options from which we were able to select a preferred corridor. 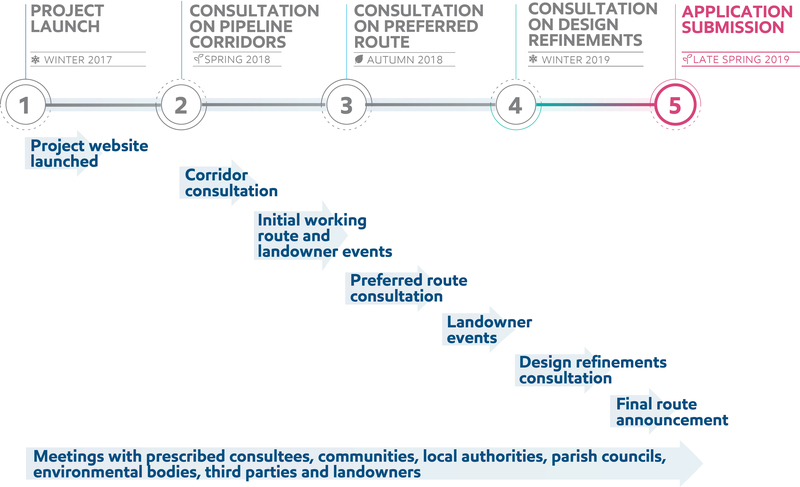 consultation helped us to confirm our proposals for the project along the majority of the pipeline route. It also helped us to select which sub-options to progress. In some areas, consultation feedback and additional knowledge helped us identify where we could further amend our design and we presented these design refinements for further consultation. appropriate route for the replacement pipeline based on the project’s guiding principles. You can see the final route on our interactive map.